5" x 7" with drawstring closure. 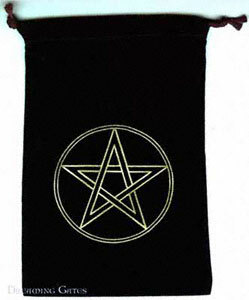 Black velveteen with gold pentacle. Uses: Big enough for a full-sized tarot pouch, but you can put anything you want inside. Pentacle lends an extra layer of metaphysical protection to whatever you want to keep.